All top seeds in the respective Divisions for the different Age Groups qualified for the semifinal stage with top seeded Haroon Aslam receiving a walk-over in the Gold Division for Boys from Jestin Robinson from Kilinochchi. Robinson grabbed the opportunity to win the Plate Division on a count-back from Lidurshan, who didn’t qualify for the match-play stage. Aslam will meet Dilshan Malinda who overcame 4th seeded T, Vikash in a nail-biting finish on the 19th hole having being all-square after 18 holes. S. Dhuwarshan seeded number 2 cruised to an 8 & 7 victory over P.G. Dewmina Shovin to meet P.A. Dimuthu of Victoria Golf who defeated Niyas Abdulla 2 & 1 in a match closer than expected. In the Gold and Silver combined Division for Girls, Taniya Minel won by the maximum margin of 10 & 7 over H M Dhaliya. She will meet fourth seed Anelka Desinghe who won comfortably beating Dhevinka Kanag-Iswaran 5 & 4. In the bottom half of the draw, no. 2 seed Sherin Mithara beat Binaara Dias 8 & 7 to set-up a semifinal clash with Arika Wickramasinghe who defeated T. Atshaya 7 up. Top seeded Nirekh Tejwani beat H.P. Alokshana Weerasinghe from Anuradhapura Golf Club 6 & 5 in the Silver Division Age Group for boys, which was a very creditable performance by the 8th qualifier from Anuradhapura who succeeded in extending the match to the 13th hole. 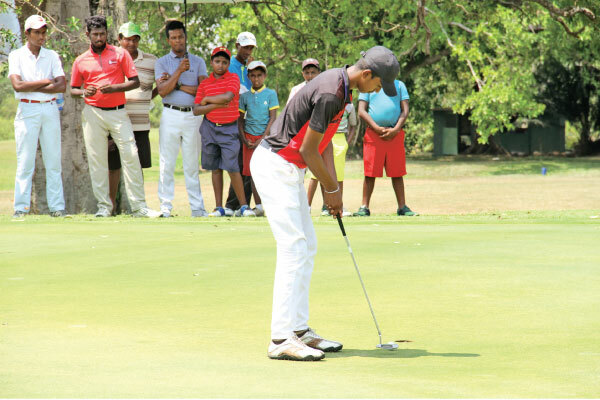 Fourth seeded Chethana Perera beat Nidushka Bandaranayake of Welisara Golf by a comfortable 6-up, to meet top seed Nirekh in the first semi-final of the Silver Division for Boys. In the bottom half of the draw no. 2 seed K. Danushan beat Pranav Muralidaran 7 & 5. He will meet 3rd seeded Levon Niyarepola who also received a walk-over from K.M.M.F. Imran Nazeer from NEGC. The Bronze Division for Boys and Girls playing off the same Tee Marker saw the top four seeds, Kaya Daluwatte, Kvahn Tejwani, Reshan Algama and Shanal Binuksha going through to the semifinals. The two semifinal clashes promise some excellent golf by the four juniors and the matches should be tight and the competition close. Kaya meets Kvahn while Reshan battles Shanal Binuksha for a place in the final. The Copper Division for juniors aged 9+ & under, the 9 hole matches were quite close with no. 5 seed Varun Fernando pulling off a victory over 4th seeded Thejas Rathis Kanth 1 up to meet top seed Dharaniyan who received a walk-over from Taj Perera, in the first semifinal. The second semifinal is sure to be a tense battle with no.2 seed Ayaan Gunasekera meeting no.3 seed Kaiyan Johnpillai, who are both well matched. Ayaan beat Raradhi Samararatne 2 up, a creditable game played by Raradhi against the no. 2 seed. Third seed Kaiyan had a tough battle to beat 6th seeded Keshav Algama 1up.